Similar to its precursor Facebook Ads, Facebook Business Manager is an integral part of any social media campaign; it has now become even easier to manage each individual account separately. Your Facebook Business Manager dashboard allows you to keep track of your Facebook data, as well as all your other social media data, in one single place! Create your Facebook Business Manager dashboard today! 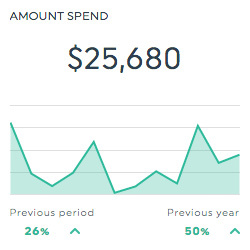 This historic widget shows the estimated total amount of money spent on your campaign, ad set or ad during its schedule. 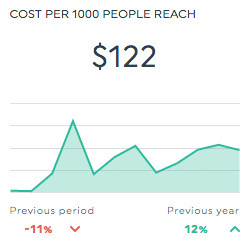 This historic widget shows the total cost of your campaign per 1000 people reached. It is calculated by dividing the reach of your Facebook Ad by the total cost of the ad, and then multiplying this total by 1000. 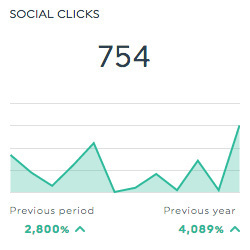 This historic widget shows the number of clicks your Facebook Ad receives (which can be anything from likes, event responses, offsite clicks, etc.) when shown with social information (ex. Jane Doe “likes” this). This list widget shows the total number of times users have clicked on your Facebook Ad. Want to see all our Facebook Business Manager preset widgets? This is calculated by dividing the number of conversions by the number of Link Clicks. This is the total number of times users clicked on an ad. This is the number of times users clicked the call-to-action button on the ad. This is the percentage of users who saw the ad and completed a link click. This is calculated by dividing the total number of actions on an ad by the total cost of the ad. This is the total number of actions that users took involving the ads (or all posts, in some cases). This is a rating from 1 to 10 that estimates how well the target audience is responding to the ad. This score, shown after the ad receives more than 500 impressions, is only visible when looking at reporting for ads and does not appear for ad sets and campaigns. This is the total number of users who took an action that can be attributed to the ads. This is the number of times the video was watched for a total of at least 10 seconds, or for nearly its total length, whichever is shortest. This is the number of times the video was watched at 100% of its length, including watches that skipped to the end. Want to see all our Facebook Business Manager metrics, segments, & dimensions? How do I create a dashboard report with Facebook Business Manager?